It's Facebook Fridays! for February 6, 2015, and, it's time to magnetically draw to you the good things of life, because love, luck, money, and success are just what the root doctor ordered! 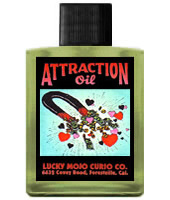 The Lucky Mojo Curio Co. is hosting a random drawing to give away 3 great Attraction spiritual supply prizes: A complete Attraction Spell Kit to bring you romance, fame, or riches; an Attraction Mojo Hand to act as a magnet for all your heart's desires; and a bottle of our famous Attraction Anointing Oil for good fortune and love are the prizes in this week's contest. First thing tomorrow morning, we will select THREE winners at random, announce their names here, contact them via Facebook to get their mailing addresses, and send them their FREE Attraction products. We have a winner! In fact, we have 3 lucky winners! Our Facebook Fridays! winners for February 6, 2015 are: Sareta Baldwin, Jon Nelson, and Earl Famanas.